We hope you are well on your way to rebuilding your home or business after the devastating floods in Calgary this year. Concrete flooring is a great alternative to carpet! It is far more resilient to water, does not promote bacterial growth, and is a much more eco-friendly solution should another flood happen. 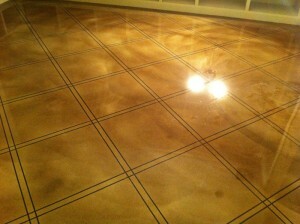 This was an old concrete floor that we used an Elite Crete overlay on, then engraved and stained it.